Custom Teamwork Hard Hat Flashlight Key Chains, Personalized in Bulk. Yellow, Blue, Red, White or Black. Best price in USA and Canada. Bulk personalized Teamwork Hard Hat key chain flashlights with battery included (inserted) . 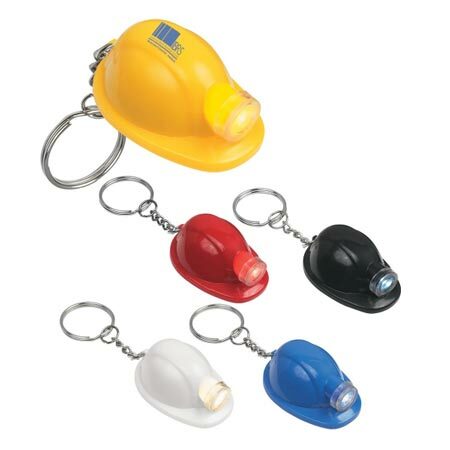 Budget Prices in USA and Canada for wholesale teamwork hard hat key chain flashlights. American Clients pay no taxes. Setup Charges: $40 per color, per location; $20.00 for repeat orders. Exquisite molded design of high-grade acrylic plastic. Additional Imprint Color: not available. Packaging: Cello bag. ; 500 per carton of 25 lbs.